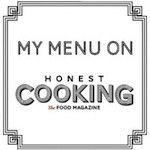 So I have recently been featured on a website called Honestcooking.com. It is so exciting and I am shamelessly plugging it now, because I just submitted a couple more articles. Watch this space! And why not follow the website on facebook, too!